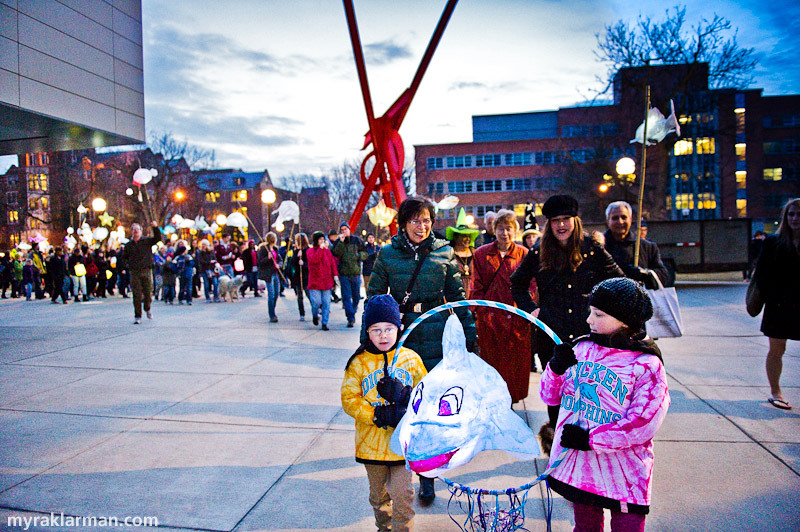 This procession embarks from the UMMA, and wends its way to W. Washington St.
Wow! The very first FoolMoon event was a crazy success — what a massive outpouring of creativity (HUNDREDS of people made their own luminary sculptures and brought them out to the street), soul-thumpin’ beats (big ups to Vulf Duo, JUICE, and the Third Coast Kings), and communal good cheer (everybody got on, you should forgive the expression, “swimmingly”)! 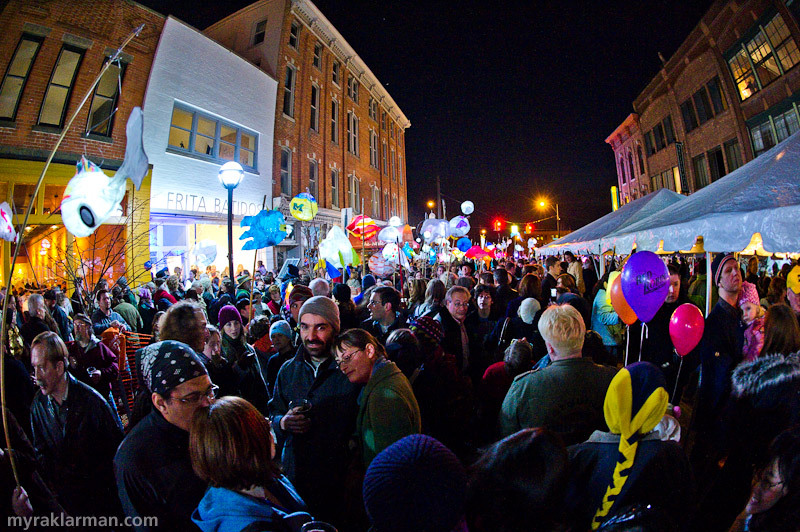 I’m still recovering, even as I’m gearing up for today’s FestiFools event — see you on Main St. today at 4pm (sleet or shine). 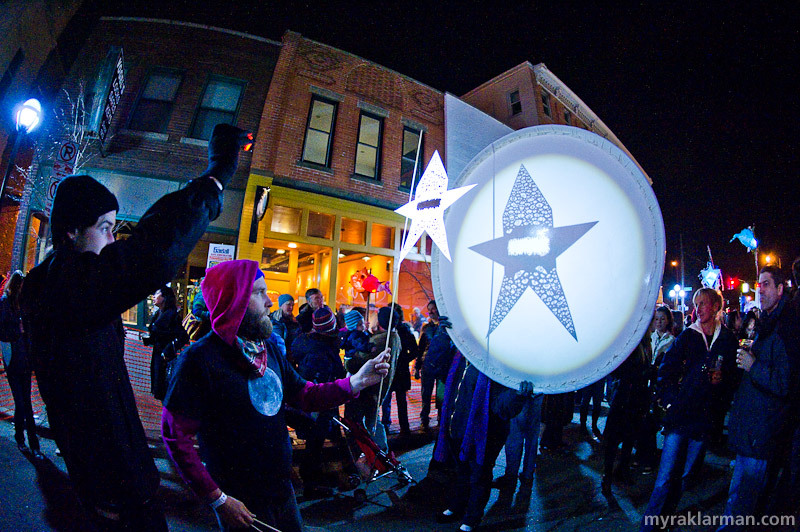 Various shadowy characters were seen at the Constellation Station at the UMMA. The College of Literature, Science, and the Arts theme semester for Winter 2011 is water. Hence, the abundance of sea creatures. I especially love the lights (bubbles?) and fluorescent poster kiosk in the background of these images. 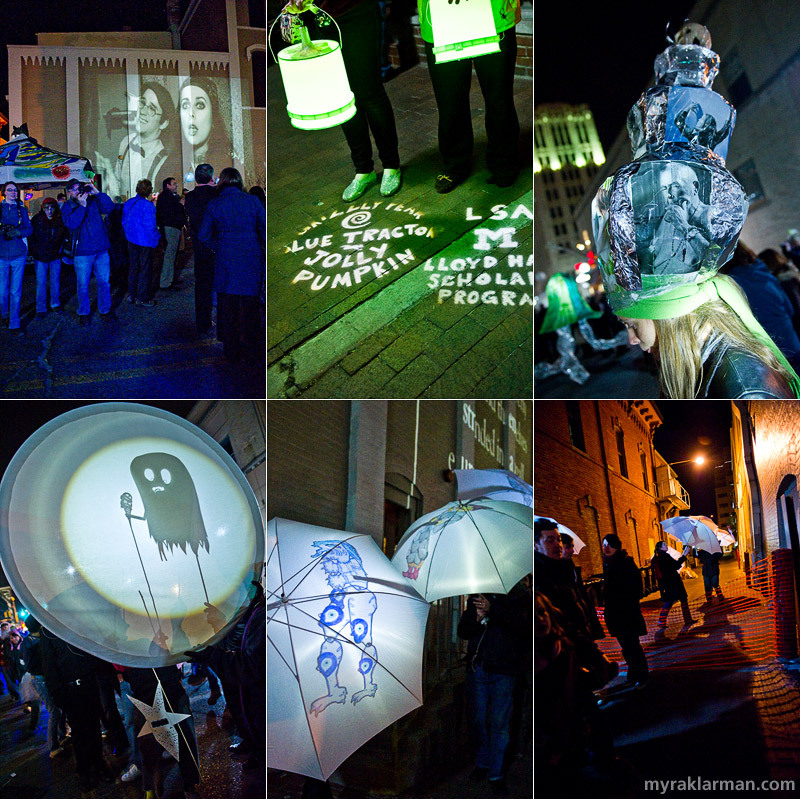 Sponsors were acknowledged in the most extraordinary way: buckets were outfitted with flashlights and covered with gobos (or stencils) allowing the sponsors’ names to be projected onto nearby surfaces, persons, buildings, etc. I love that FestiFools came up with such an imaginative, appropriately Foolish, and frankly beautiful way to thank its sponsors (talk about glowing praise). 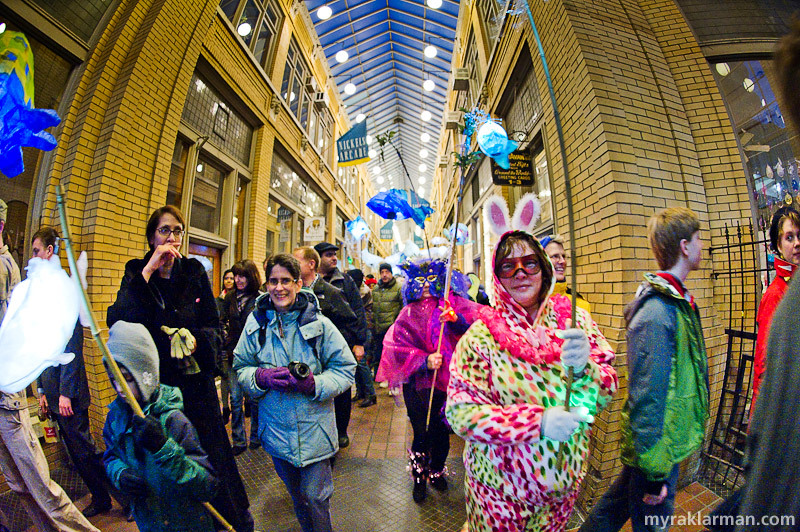 Pulled out my fish-eye lens just in time to capture the procession walking by the Fishbowl. 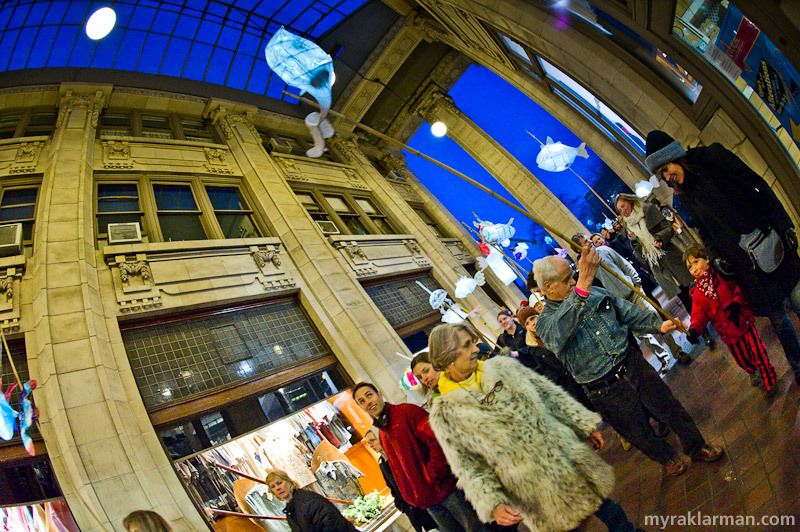 Entering the Nickels Arcade. I feel as though I’m standing on the bottom of a huge aquarium and looking up at the fish swimming in the water above me. So much of the event was beautifully surreal. 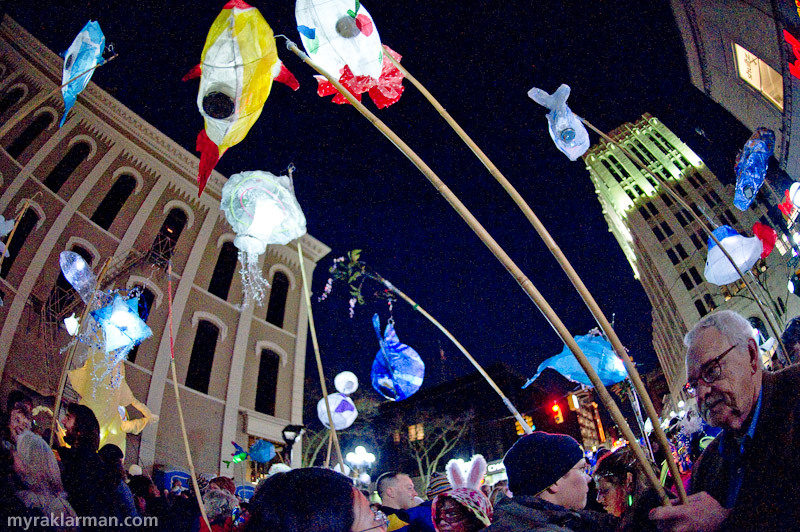 Luminaries enjoy a refreshing swim in the clear night sky on W. Washington Street. 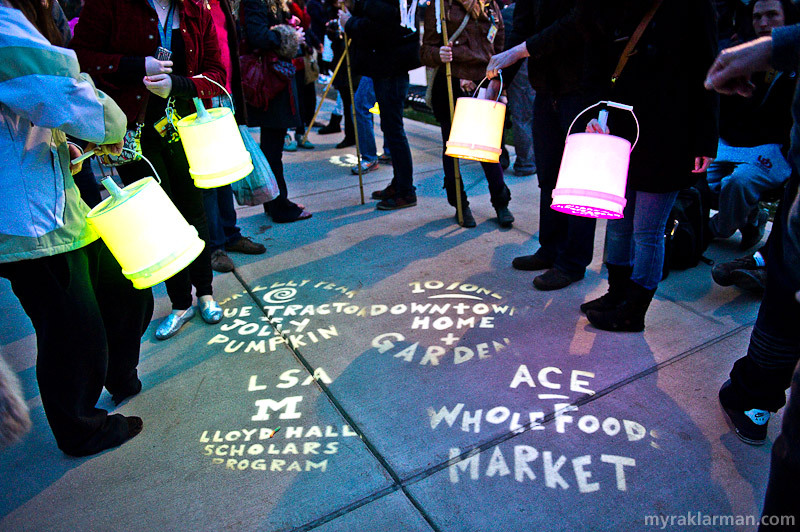 These luminaries were created by (l-r): Jimmie Thompson, who facilitated the luminary-building workshops at Workantile; Rick Cronn; and FestiFools steering committee member Gretchen Adracie. This giant orange and yellow fish nibbled on everything it could get its animated lips on. | I coulda sworn this guy told me that he wasn’t wearing a transformed juice container, but rather “drier lint.” The best response I could muster was: “And I’m talking to my water heater.” | The hair designers from Orbit were busy creating luminous coifs. Because FoolMoon was a nighttime event, all kinds of cool things with light and shadow were possible: Films projected onto buildings. | The sponsor gobos in action. | A multi-tiered, hat with backlit transparent images. | Patrick Elkins’s shadow puppets. | Colorful figures projected onto white umbrellas. | Before mysteriously disappearing down the alley. Local puppeteer Patrick Elkins in action. Taking in the wondrous view as I attempt the trek to the other end of W. Washington. Another breathtaking view of Washington Street. I can hear music, but I can’t quite see it yet. Here’s the stage! And just in time to catch the end of JUICE’s set. The Third Coast Kings are one tight outfit! 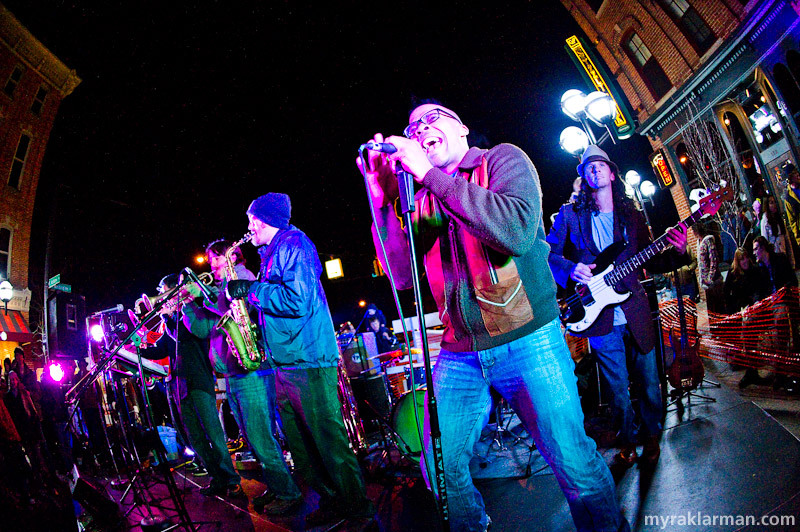 If you dig James Brown, then this is an act you’ll appreciate. And if you don’t dig James Brown — well, I can’t even fathom such a contingency. So, so lovin’ the Third Coast Kings. U-M students Meryl Waldo and Aislinn Frantz. | FestiFools’ creative director Mark Tucker has forsaken traditional bling, opting instead to simply wear a canister of money around his neck. | Max (looking extra tall and slim thanks to lens distortion) enjoys the Third Coast Kings minutes before we whisk him away to bed! 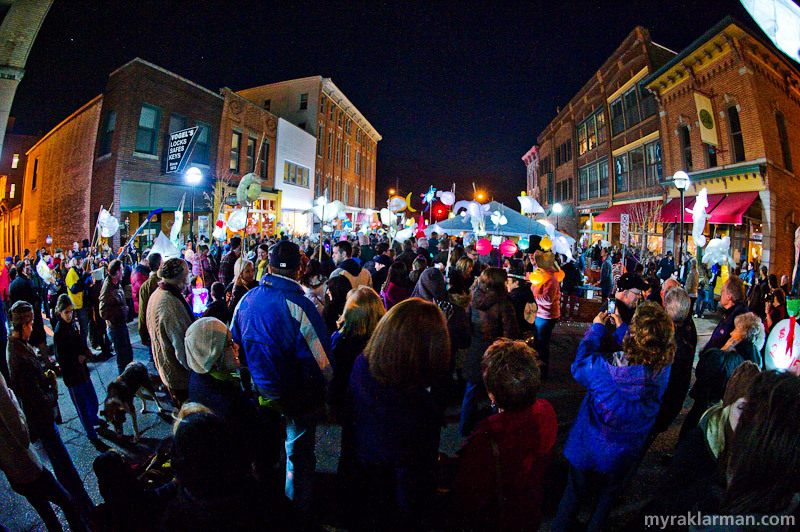 Myra has a great eye for photography and her technique using the fish eye lens was perfect for FoolMoon. Beautiful color photography. Way to go, Myra! Way to capture the FoolMoon Myra! 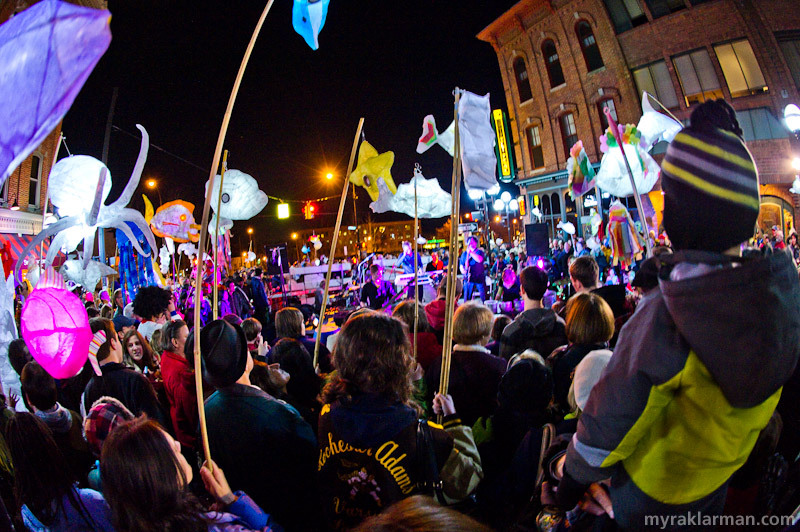 What a great Ann Arbor evening – eclectic, creative, musical, community-driven. The kids just weighed in – 3 of 3 voted ‘awesome’ good time! I was absolutely BLOWN AWAY by this fabulous event! 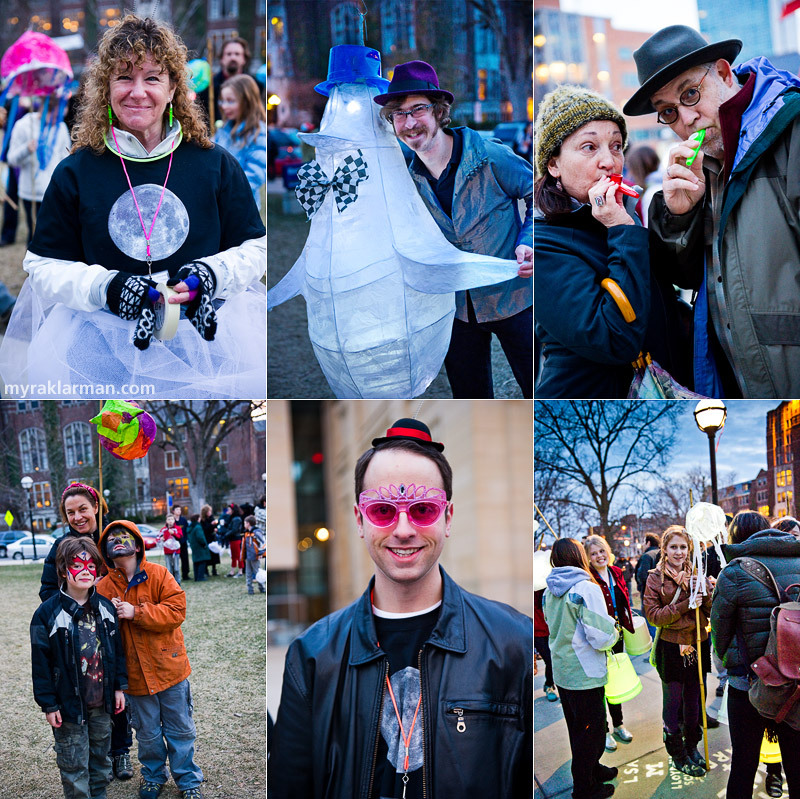 The luminary walk was nothing less than magical that really brought the community together. 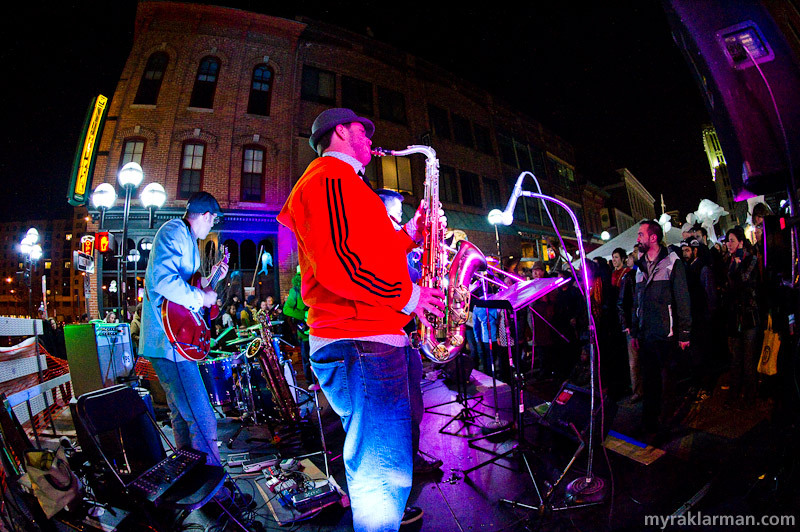 The block party on Main St.street was packed with people dancing to the phenomenal bands including the funky Third Coast Kings as well as enjoying the amazing shadow puppetry, original film festival, as well as the delicious food and beverage provided by Grizzly Peak. 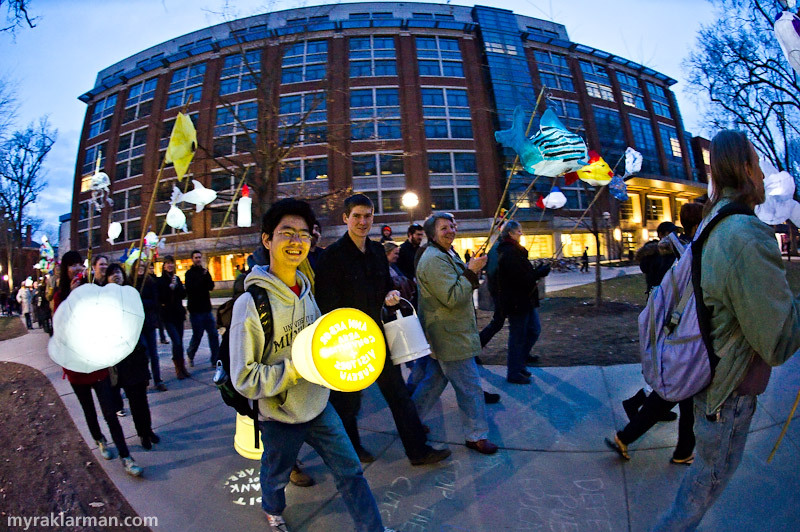 Overall it was a fantastic evening that really brought the Ann Arbor community together. I can’t wait for next year!! 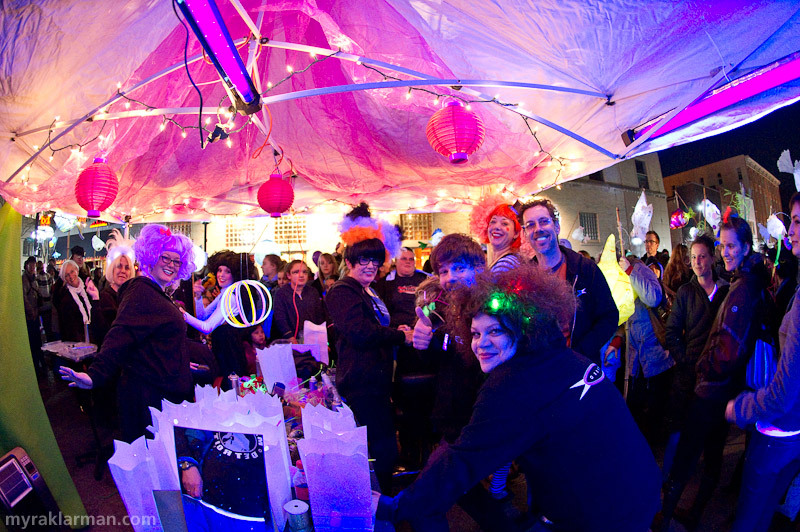 Great photos – looks like an amazing event. We will definitely make sure we are not out of town for next year’s event.